Bloggers4UKIP: Fascist union leader calls UKIP "pre-fascist"
Fascist union leader calls UKIP "pre-fascist"
A leaked report by Unite (the union currently being investigated for fraudulently signing up its members to the Labour Party to rig election candidate selections and the Labour Party's biggest donor) describes UKIP as "pre-fascist" and "xenophobic". The Ukip vote represents a dangerous, populist right-wing vote which is swayed by anti-immigrant and anti-European rhetoric – and nostalgia for a comfortable world that never really existed. These are all the hallmarks of pre-fascist movements – which is not to say that Ukip is fascist, because it isn't, but to point to the dangers of ignoring them and the issues or attempting to chase them. The threat of xenophobic UKIP remains very real – in common with right-wing populism and indeed fascism, which is growing dangerously across Europe. This is nothing more than left wing extremist nonsense from a trade union that has absolutely no respect for the democratic process and thinks that the country should be run by trade unions. The unions choose the Labour leader, the unions dictate Labour policy, the unions buy Labour MPs and councils and under a Labour government, the unions call the shots. 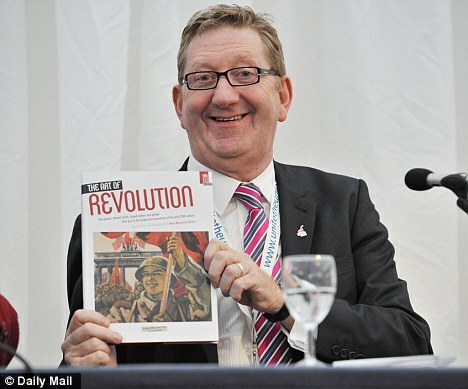 The leader of Unite, Len McCluskey, is the head of a marxist putsch comprised of militant trade unions and other left wing pressure groups determined to oust the Tories and reinstate their Labour sockpuppet government. They know that UKIP is a threat to Labour as much as it is to the Tories, hence these ridiculous comments. If and when Labour get back into power and the unelected union leaders that appointed the Milibeast as leader are running the country, then we can start talking about fascism.